So, it looks like the team in Texas has discovered a minor glitch in the 2003 Configure Email and Internet Connection wizard. 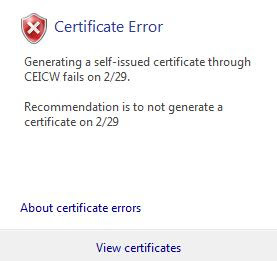 It looks like it won't install re-new certificates on a leap year. The Official SBS blog has details here. An error occurred while configuring a component. To continue with the wizard and configure remaining components, click OK.
To end the wizard without configuring the remaining components, click Cancel.